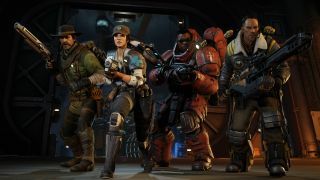 I spent a day and a half at Turtle Rock Studios last month playing Evolve's now-revealed other multiplayer modes: Nest, Rescue, Defend, and Evacuation, a kind of multiplayer campaign that bundles all of Evolve's formats into a five-round match. Watch the video above for my thoughts on playing, and on Evolve's potential as a competitive FPS. If you want to judge the new modes for yourself, look below to two uncut, 60fps gameplay videos, one as a hunter, one as a monster. Don't mind the Xbox controller button UI—it's just a menu setting that wasn't changed.